Heading out to dinner? 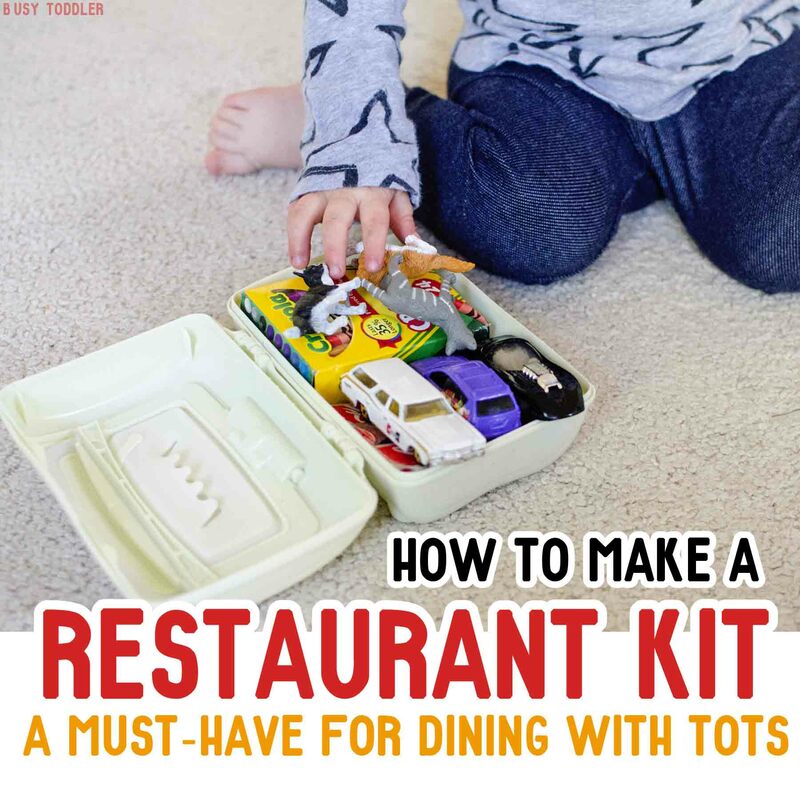 Make a restaurant kit for your toddler! Going out to a sit down restaurant with toddlers isn’t exactly my favorite thing. In fact, it gives me the panics and the sweats and makes me want to hide. But it’s just an unavoidable part of life: you will need to take your wild toddler child to a restaurant. With my two toddlers (3 years old and 20 months old), I’ve put together the perfect restaurant kit for toddlers to survive dinners out. You’re going to love this idea! Putting together your restaurant kit is simple! Keep the toddlers occupied so I could actually enjoy my meal. What did I put in my survival kit? YES ALL THOSE ITEMS FIT INTO THIS SMALL CONTAINER! It was a bit of a Tetris game, but I nailed it getting all these items to fit. 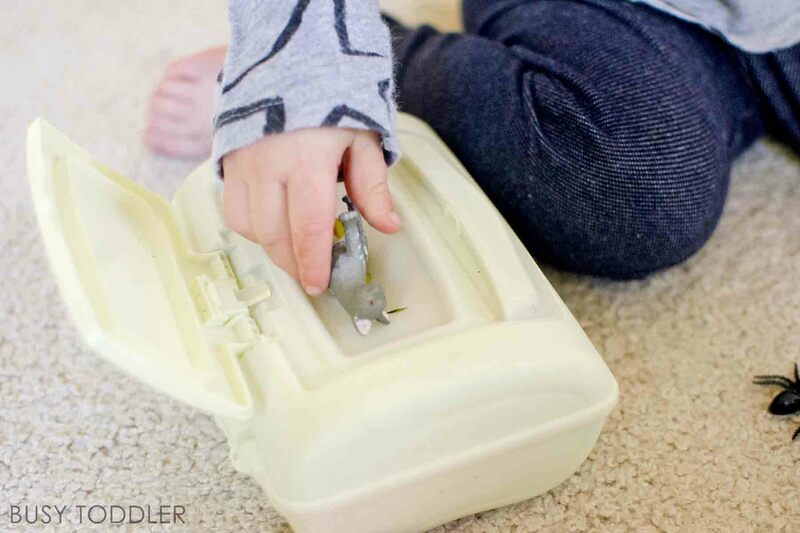 The small wipes container is easy to open, easy to carry in, and has a slit for toys to fit in and out of. That’s activity number 1. 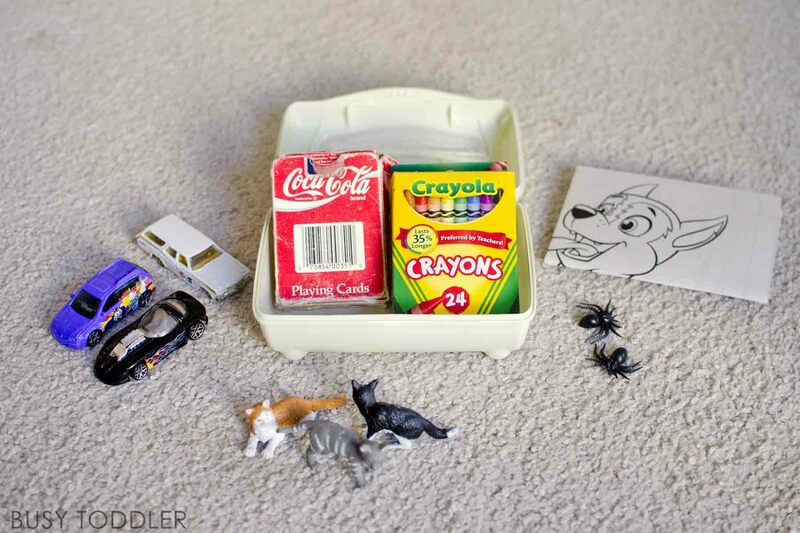 Putting small animals, spiders and cards in and out of the container (it’s a lot like this awesome activity). 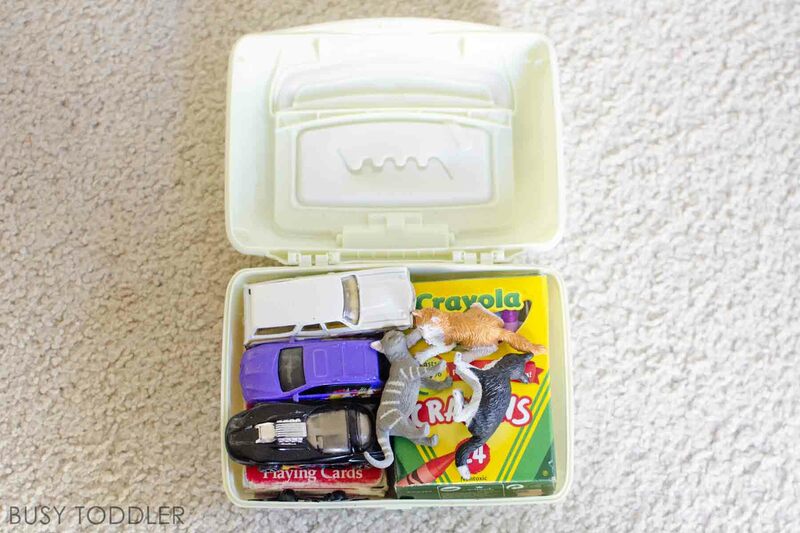 The cars, animals, and spiders are small enough to be hidden under sugar containers and glasses at the table. 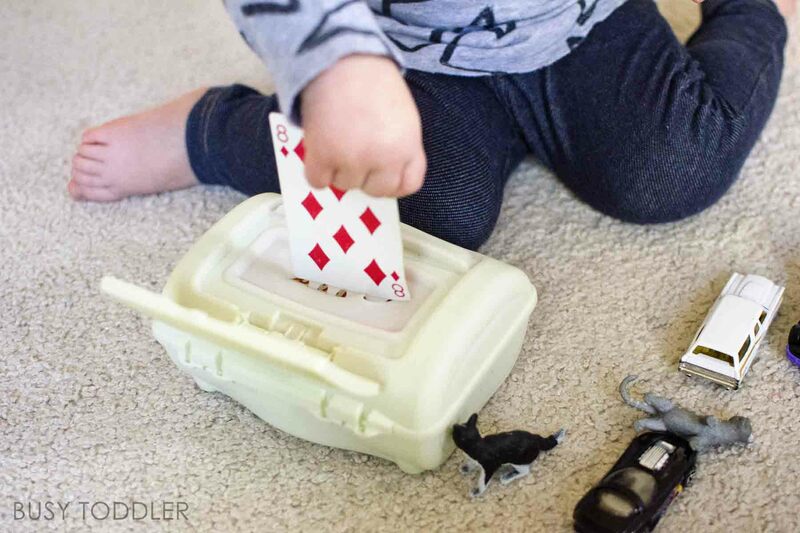 Play any number of simple toddler card games – these four are perfect for toddlers. The crayons and coloring book pages – yes, they often have crayons at restaurants but they aren’t the best. And the coloring pages are usually meant for elementary aged kids. By bringing our own, I could make sure it was age appropriate and that my kids would be into it. Use any of the items from the kit to play “What’s Missing?”, our favorite restaurant game, or “Over Under”, our other favorite. Try playing “I-Spy” with all these items laid out together. Keep this kit for later! I’m so glad I have this little survival kit now. I’ve tucked it away for safe keeping and to make it special when it comes out. Yes, a cell phone can make a great survival kit at a restaurant, but I don’t have the data for that or two cell phones (1 per kid). This kit is a way better option in my opinion. I love that it’s small, my kids can play with the contents at the same time (I don’t need two kits), and it really does hold their attention. 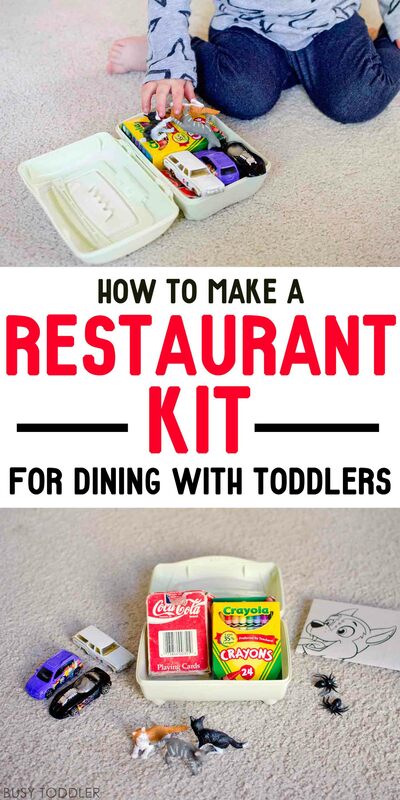 Going to restaurants with my toddlers still isn’t my favorite thing to do with them, but it just got a whole lot more manageable with this restaurant kit toddler. 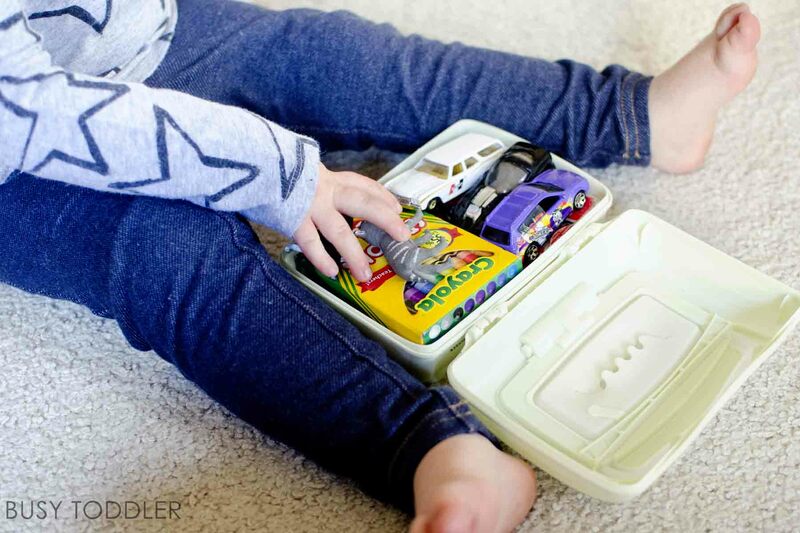 What would you put in your restaurant kit for toddlers? For me, the fear isn’t from going out to dinner itself, it’s the getting off schedule! Inevitably, dinner and driving home means we are late to bed, which makes for a hard day tomorrow! However, this is a great idea. I have twin toddlers so the same concept would work for my two. I will be putting this to the test next time we go out. I think I will even just make up the kit and keep it in my car. This might even work for our next plane trip! Hmmmm, my hamster is working overtime ?